Norman Keith Boardman was born in Geelong, Victoria in 1926. He attended Geelong High School for five years then did a Leaving honours year at Melbourne Boys High School. He was awarded a Dafydd Lewis Scholarship to study chemistry at the University of Melbourne, receiving a Master of Science in 1949 for his thesis on the properties and thermodynamics of molten salt mixtures. He worked at the Wool Research Section of CSIR for two years where he attempted to shrinkproof wool, then went to Cambridge in 1951 to do his PhD on the separation of proteins by ion-exchange chromatography. He received an ICI postdoctoral fellowship to continue his work at Cambridge on the separation of proteins. He received a PhD and a ScD in biochemistry from the University of Cambridge. In 1956, Boardman returned to Australia to the CSIRO Division of Plant Industry in Canberra to set up their chromatography facilities. Here he investigated protochlorophyll and its conversion to chlorophyll. His work with Dr Jan Anderson characterised the chlorophyll complexes sufficiently to show that the two photochemical systems of photosynthesis were physically separated. Boardman was also interested in the structure and development of chloroplasts in green plants. In 1964, as a Fullbright scholar at the University of California at Los Angeles, he prepared chloroplasts and achieved cell-free synthesis of chloroplast proteins. Dr Boardman’s research interests included the adaptation of plants to their light environment. During the mid-1960s to mid-1970, he was involved in characterising the photochemical systems and looking how the photosystems and photochemical activity developed during greening. He also carried out studies on the comparative photosynthesis of sun and shade plants. 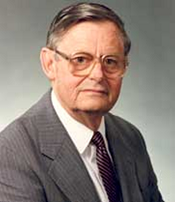 Dr Boardman was a member of the Executive of CSIRO between 1977 and 1985. He became Chairman and Chief Executive in 1985 and Chief Executive in 1987 after the separation of the two positions. A full account of the life and achievements of Keith Boardman can be found by following the links in the Source details below.